Analytic Dashboards and Reports created in minutes and ready for secure collaboration, interactive exploration, and scheduled subscriptions delivery! 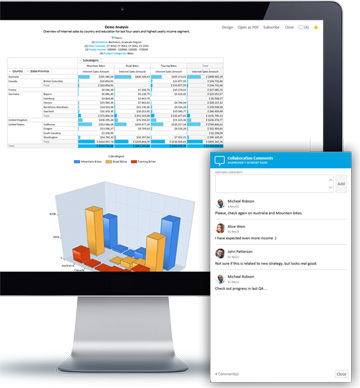 User-friendly and quick setup BI platform! 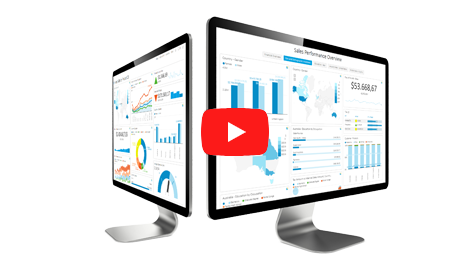 The fastest way to create beautiful custom analytic reports and dashboards based on your requirements and using your own OLAP, SQL and CSV data sources, to share and collaborate with other users. Kyubit is definitely best option in case it's needed to represent cube multidimensional data online - it'll provide reliable, fast and easy way to display information in very flexible way with option to export to Excel and PDF formats. It's important to note very good support of Kyubit, which was all time available and solving our usage questions. The software is lightweight and fast. Support guys are one of the best I've met so far. I think you guys have a great product. From my perspective, the Kyubit Business Intelligence plays a very important role in being able to deliver a complete enterprise solution based on Microsoft SSAS architecture. Kyubit is a feature rich product that accomplishes core analytical needs at a fraction of the cost of other analytical tools. The Kyubit support team has been very responsive to our needs and we were able to successfully and effectively integrate Kyubit into our existing product. Easy to use, create reports in seconds and drill to the finner detail. The product has great support and is continuously moving forward. Kyubit allows us to deliver analysis & reporting solutions quickly and simply. We like flexibility of report subscriptions and overall simplicity of user interface. Your support is very efficient and responsive, your licensing model that includes constant upgrades and new features is mostly welcome! Kyubit Business Intelligence satisfied us and our customers with its clearly structured, user-friendly and easy-to-use interface. Moreover the application works efficiently and reliably. We truly appreciate the continuous further developments and the good support. Therefore we could recommend fully this tool for the use with SQL Server Analysis Services Databases. I think it’s one of the better options for SSAS users and has lots of potential. Winston Graver‎Business Intelligence Consultant at Management Control Systems Ltd. Contact us on support@kyubit.com for assistance, questions or comments on Kyubit Business Intelligence in evaluation or production usage. Read usage details documentation with product manuals for installation and administration, OLAP analysis manual and Dashboard user manual. Watch Kyubit BI Tools Videos overview on our site or Kyubit channel on YouTube, showing most interesting features of Kyubit BI product in action. Check product BI Features Sheet page to discover all points of Kyubit BI Tools usage, which also serves as good product possibilities reminder. Download full version of KYUBIT BI Server. Download and setup will take a few minutes of your time. Send us your feedback on Kyubit BI impressions. Kyubit BI Server delivers comprehensive OLAP analysis for your Multidimensional and Tabular OLAP models within your browser with fast asynchronous responses and intuitive user interface. 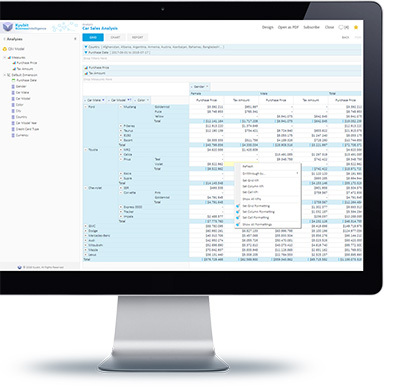 Quick product setup, OLAP standard analytic features, visual analysis, OLAP Reports, and OLAP Scheduled Reports subscriptions are key features of Kyubit Business Intelligence. Convert your analysis to PDF or Excel file, share with your team or subscribe to fresh data at the scheduled time. Analyze OLAP data with descriptive Grid view or visual Chart view. Transform SQL query results (or CSV files) to Analytic Models for self-service data exploration, analytics and visualizations and sharing with other users. Drag-and-drop user-friendly creation of analysis, reports, and dashboards based on OLAP data or 'Analytic Models'. Easy to learn process of Self-Service BI (data modeling, analysis and visualization), each end-user can adopt with no special training or BI skills. 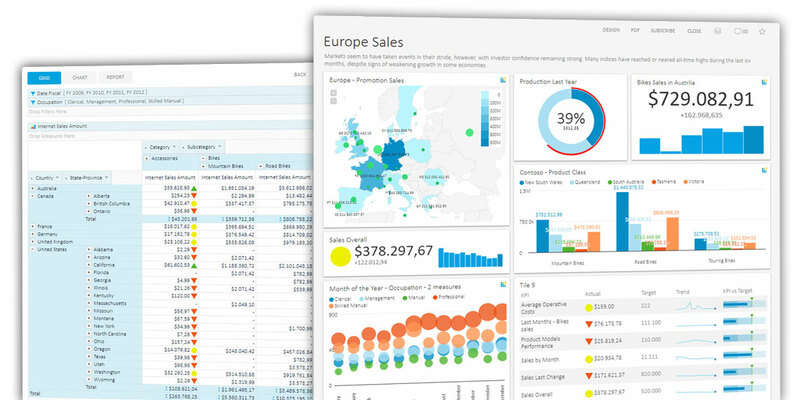 Dashboard Tools to create important insights based on data from your SQL and OLAP databases are quickly designed to present most valuable information from your business environment. Use Kyubit Dashboard Software to create KPI or Gauge Metrics, 20 different dashboard visualizations, interactive dashboard filters, and OLAP actions or collaborate using comments with your team. Share analytic Dashboards with authorized users on local intranet or internet, subscribe to Dashboards and receive fresh data at the scheduled time. Apply dashboard filters, enlarge dashboards tiles, convert dashboard to PDF file. 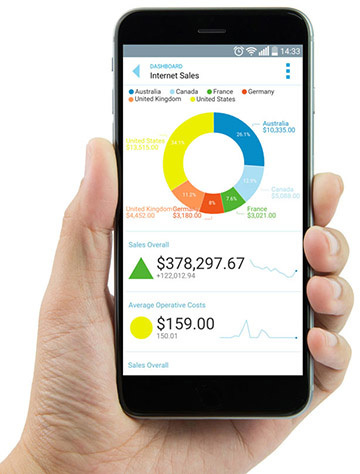 Access Interactive Dashboards and OLAP Features with your mobile devices. Mobile BI features with Kyubit software are accessible using modern web technologies (HTML5, CSS3) and mobile web browsers. Connect to your Business Intelligence content with Kyubit application published on the Internet or use local intranet wireless connection. All charts and other dashboard visualizations are available on mobile view, while OLAP data-based chart offers additional analytic features. 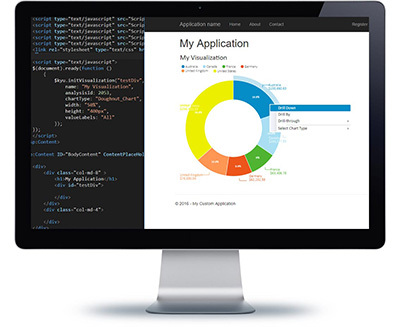 Embedded BI and Embedded Analytics within your environment to use the power of data analysis and visualizations, working together with your application requirements. Find out all embedded BI possibilities on our website or contact us for specific integration options. 3,100+ installations in more than 35 countries use our product. 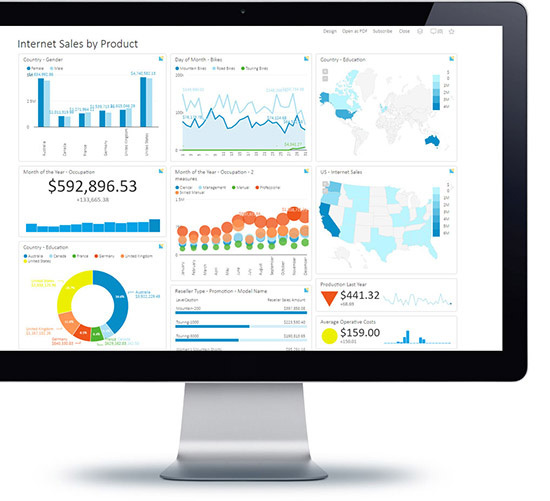 Kyubit Business Intelligence is a BI Tool that will help create an awesome Business Dashboards and Analysis Reports! Take a tour on product features to see how our software can assist you in everyday data business intelligence tasks. Be the part of the Kyubit Business Intelligence, OLAP analysis and interactive Dashboards future and let us know your questions and comments about our software. We welcome your feedback!